Would you like to feel more confident and self-assured? Do you endlessly check or recheck actions? Do you worry constantly about everyday occurrences and activities? Do fear and anxiety appear for no apparent reason? difficulty breathing, feeling as though you 'can't get enough air'? terror that is almost paralyzing? hot flashes, or sudden chills? tingling in fingers or toes ('pins and needles')? fear that you're going to go crazy or are about to die? Anxiety disorders can affect anyone. Stress is a normal part of life. We have big and little stressors everyday. But when we don’t manage our stress well, anxiety takes over. Perhaps you fear making changes in your life, or experience feelings of panic and dread and don't know why, but you do know these feelings can at times immobilize you. Anxiety and panic can be mild, moderate, or severe. 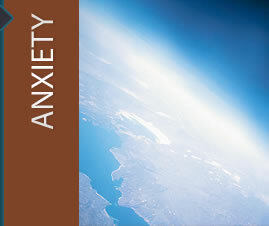 Everyone experiences at least mild anxiety at one time or another. But when anxiety interferes with your ability to function, it is time to call for help. Anxiety often comes when people ignore their fears and the problems that are causing those fears. A panic attack is a sudden surge of overwhelming fear that comes without warning and without any obvious reason. A panic attack can include a pounding heart, sweating, trembling, shortness of breath, dizziness, numbness, and a sense of losing control or dying. When one sees that anxiety is actually a helpful warning device and learns how to address the problems in life that are fueling the anxiety, the patterns of anxiety and avoidance are replaced with awareness and calm.